Supergirl just gets better and better. 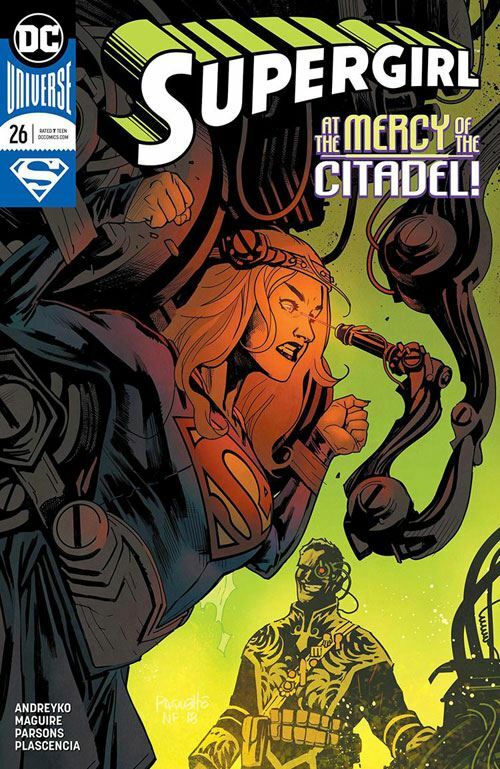 This issue sees Supergirl fall into the hands of Harry Hokum, a villain not seen for quite a while. He was an old foe of the Omega Men, so I am not giving too much away by revealing that that team pops up in the story as well. DC has rebooted the Omega Men so many times since the New 52 began. Andreyko reaches back to the early days of the team with this incarnation, even bringing back some members who had been killed off. Normally that would bother me, but by the end of this issue even that makes sense. Supergirl may not be getting much closer to the answers she is seeking, but at least we are having a fun ride along the way. And the Omega Men should prove to drive the next few issues of the story. And I am glad that Andreyko has an engaging story unfolding. Because in a sense it doesn’t matter. Maguire’s artwork is so good, and appears to effortlessly beautiful, that this book would be a treat to read even if Supergirl and the Omega Men decided to sit around playing canasta. Not that I want to read an issue of them sitting around playing canasta. But I would if I had to. So I am much happier reading an entertaining space romp that brings back some classic characters, ones with a lot of unused potential. Another excellent outing. Kudos to all involved.